Friday January 9th 1891 I worked on the rags in the forenoon. Mother went to town in the afternoon. I practiced two hours in the afternoon and sewed again in the evening. Saturday January 10th 1891 I helped Anna some with the work and practiced two hours before noon. I was over at Hatts all the afternoon. I brought Mother home in the cart. Will went back to town in the evening. Sunday January 11th 1891 Will took me over to church this morning and brought me back. he went out to Dentons in the afternoon. Mother and I read all afternoon. Uncle Jim Mc was here in the afternoon. I wrote a little in the evening and went to bed early. weather colder. Monday January 12th 1891 I was busy about the work all the forenoon. Anna done the washing. Mother went to town in the afternoon and did not come home. I practiced some and worked on my carpet rags. quite a cold day. 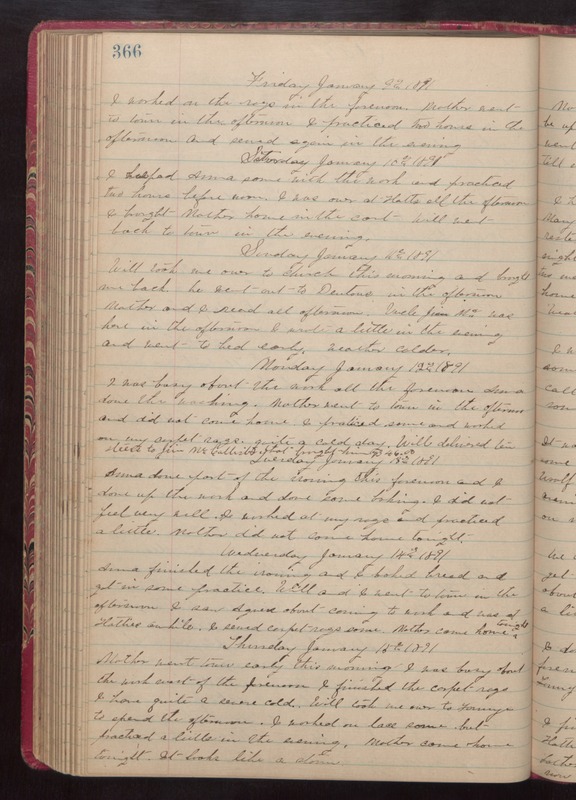 Will delivered ten steers to Jim McCallister that brought him $346.00 Tuesday January 13th 1891 Anna done part of the ironing this forenoon and I done up the work and done some baking. I did not feel very well. I worked at my rags and practiced a little. Mother did not come home tonight. Wedensday January 14th 1891 Anna finished the ironing and I baked bread and got in some practice. Will and I went to town in the afternoon. I saw Agnes about coming to work and was at Hatties awhile. I sewed carpet rags some. Mother came home tonight. Thursday January 15th 1891 Mother went to town early this morning. I was busy about the work most of the forenoon. I finished the carpet rags. I have quite a severe cold. Will took me over to Fannys to spend the afternoon. I worked on lace some, but practiced a little in the evening. Mother came home tonight. It looks like a storm.